Hello everyone, welcome. Today I am sharing a post I found on the Fantasy Flight Website about GM’ing an rpg Campaign where players are called to make the ultimate sacrifice. The following text is an excerpt and I encourage you to click the link back to the full article to have a read as it is full of good stuff. My thoughts will appear after the excerpt (In fact my thoughts may not make sense if you don’t read the full article). 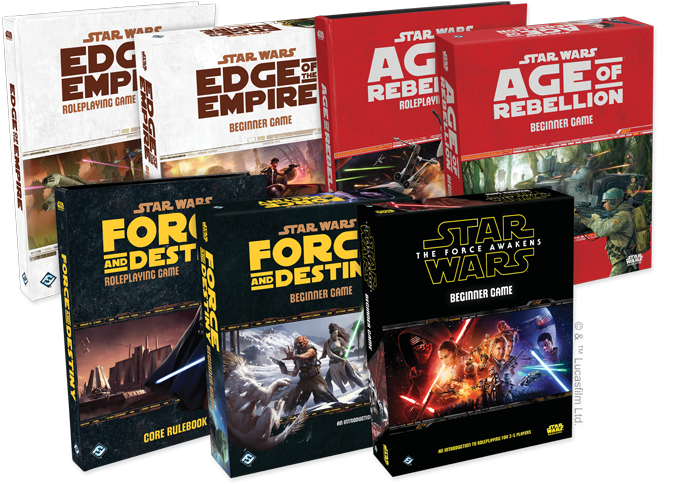 Images used on this article are from the Fantasy Flight website, and the author of the article is Bryan Young. He writes in support of Star Wars RPGs, and uses the Star Wars Universe as a basis. I should warn you, it is a bit spoilery about Rogue One if you haven’t seen it. Like Star Wars™ fans around the world, we’re eagerly looking forward to Episode VIII. At the same time, we’re delighted simply to live in this new age of Star Wars riches. Constantly growing with new movies, television shows, novels, comics, and more, the Star Wars galaxy is larger and brighter than ever before. It’s also more diverse. Recent materials have focused on both a greater diversity of characters and styles. And while the Star Wars galaxy was always full of potential for stories of all shapes, sizes, tones, and themes, we’re seeing more of them realized than ever before. From the expansion of the classic Star Wars saga presented by The Force Awakens, to the formation of the Rebellion in Star Wars Rebels, to the gritty war genre stylings of Rogue One, there’s more here than ever before. I love the concept. I can see the awesome potential of playing a campaign where the players are maneuvered into a situation where there is no real way out for them, their very own Kobayashi Maru (Star Trek Reference – the Kobayashi Maru is the unwinnable scenario that Starfleet uses to train cadets on the command track to learn that there isn’t always a way out. James Kirk is the only person to ever win…). I think something like this would be intense and emotional, handled correctly. That all being said, I have additions to Bryan’s article that I feel are missing. Emotional Investment – I would do my utmost to make it personal for at least one of the players. Have their character experience the horrors of the war up close and personal, so that they become emotionally invested more in victory than survival. This could be the old cliche of the dead mentor, or loss of parents such as Obi Wan Kenobi and Luke’s aunt and uncle in Star Wars. Be warned, this can backfire. Emotional investment is great when it leads to unexpected leadership from one of the characters. It can also lead to stubborn pigheaded behaviour by a character that can be destructive to the group – and not in a blaze of glory kinda way. Prologue/Epilogue – For something like this I would definitely do a prologue and an epilogue. The prologue introduces the characters and part of their backstory, and it is at this point that I would force a character to suffer some form of loss, to bring them emotionally into the story. The epilogue is done once the sacrifice is complete. The players are likely dead by this stage, however the epilogue is a window into what happened next. So, if the mission was to sabotage an Imperial Airbase in an asteroid field before a medical convoy enters the system, then I would show the convoy arriving unimpeded, with their supplies being distributed to the folks needing help. I might even have the convoy leader transmitting a thank you, never realising there is no one left to hear it. Equally, if the players were left a way out that would assure mission failure I would use the epilogue to show their escape, and even any benefits they might have reaped by escaping. I would also show the convoy being shot to pieces and the consequences of their failure. I remember a homebrew game I played, using various 80s movie icons. Jareth, the Goblin king, recruited Daniel (the Karate Kid), Edgar Frog (Lost Boys), Jack Burton (Big Trouble in Little China) and Data (From the Goonies – played by me) to go to the Tron Realm to “Rescue” a child from Clu. I should say all the player characters were about 20 years on from the films, so Data as an adult etc. As the story progressed we realised the Goblin King’s intentions were not honourable, but that didn’t stop Jack Burton making a deal with him to abduct the child in exchange for a reward. The deal was struck and Burton managed to summon a horde of Goblins at the right time, stealing the child. A portal was left for us to leave, to go back to the real world and our families, knowing that what we had done had actually disrupted the Tron World. 3 of 4 characters returned home. But Data stayed. He wasn’t doomed to die, but he was almost certainly trapped if he didn’t leave then and there, but he couldn’t leave the folks of Tron World to the disruption his group had caused. So, whilst three PCs returned home at the end of the adventure, I chose to have Data remain. His finale, his epilogue was to have him walk into the Tron World whilst the GM camera remained motionless – he got further and further away until I couldn’t see him any more. But it was ok, because Goonies never say die! Truthfully, I do not believe the adventure was set up as an opportunity for characters to sacrifice themselves heroically. However, if it had been I think it would have had less impact if I had known it was coming. So, those are my thoughts. What are yours? Have you played in a heroic sacrifice campaign? Would you play or run one given the opportunity? And would you want to know it was coming? Thanks for reading! I have to ask. Would you want to know that the game was built around an unwinnable/self sacrifice situation? Or would you want to choose?